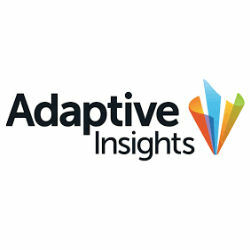 Adaptive Insights (formerly Adaptive Planning) is a leading provider of corporate performance management (CPM) and business intelligence (BI) software for the enterprise. The Adaptive Insights suite of products are SaaS platforms that include consolidation, reporting, business intelligence and more. Adaptive Insights was named a Leader in the Gartner 2016 Magic Quadrant Strategic Corporate Performance Management Solutions report. Adaptive Discovery provides a high-level overview for business owners and leaders so they can see at-a-glance how the overall business is performing. Customizable, drillable dashboards make it easy to see funnel, dial, waterfall, bubble, histogram, radar, and Pareto charts, as well as standard bar, column, gauge, area, and doughnut charts. Adaptive Suite is end-to-end enterprise performance management software that enables business owners and leaders to visualize overall corporate performance, create strategy, plan effectively, and generate reports measuring results.